Following the Manhunter Lana Lang from the end of SUPERMAN #13 (as seen in Crossovers Week 2), Superman lands in Smallville where he meets his old friend Pete Ross and the town doctor, Dr Whitney. 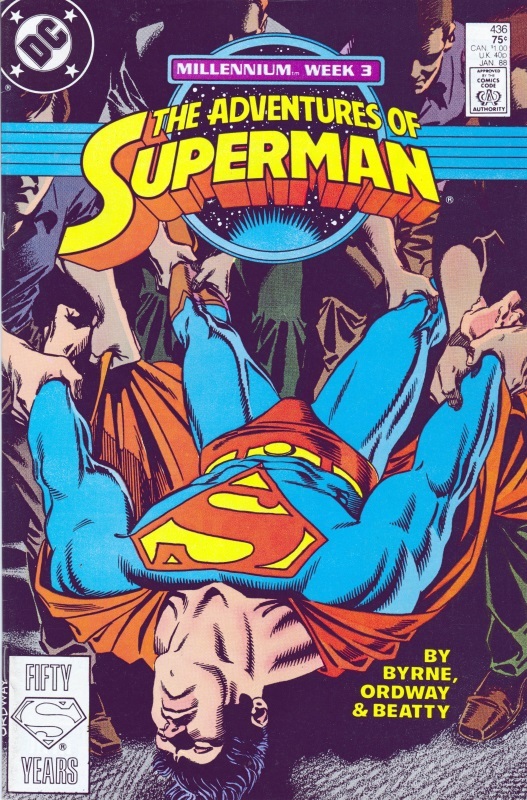 The doctor distracts Superman long enough for Pete to fire a weapon at him that renders him unconscious. He wakes as a prisoner of the Manhunters with the android Whitney informing him that in the last 30 years, whenever he delivered a baby (including Lana and Pete) he implanted a microscopic inducer that remained within the person, just waiting for Whitney’s command. Superman escapes and confronts Whitney who self-destructs rather than being captured, leaving Superman to face something that will be revealed in ACTION COMICS #596 in Crossovers Week 4. 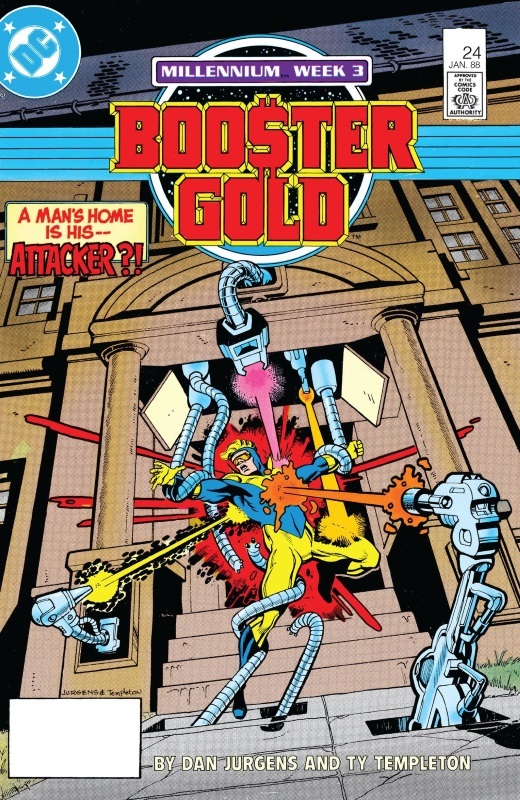 When Booster returns to his mansion, he is attacked by its self-defence systems, including new ones that he knew nothing about and which appear to have been designed to strike at his weaknesses. Escaping them, he realises that they could have killed him but, instead, they were simply weakening him prior to the attack by his Manhunter, his agent/manager Dirk Davis. While they fight, Davis manages to convince Booster that the Guardians and Zamarons are attempting to control the future of Earth and that the Manhunters stand against them to protect humanity. Begrudgingly agreeing with him, Booster signs up with the Manhunters in return for his previously stolen fortune to be returned. He then organises a press conference and tells the watching world that the Justice League and other heroes are wrong and should be stopped. 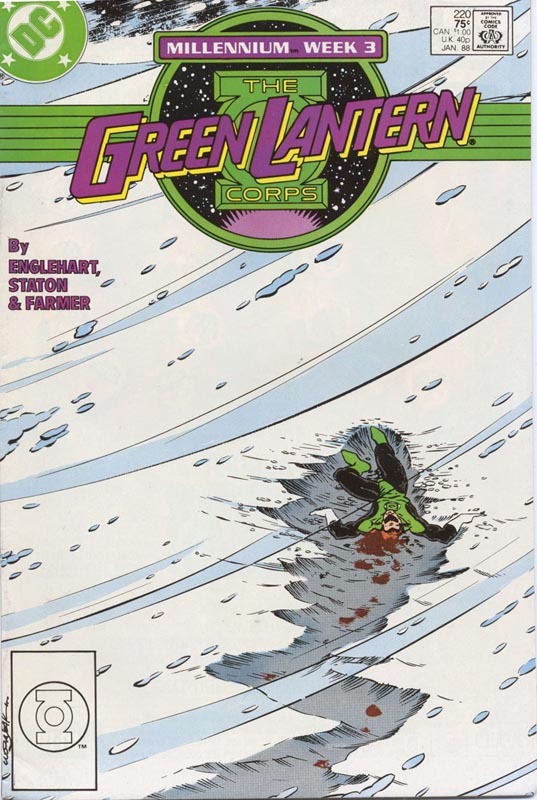 Following the end of MILLENNIUM #3, Hal Jordan plans to take off in search of the missing Tom Kalmaku. After Celia Windward challenges him to leave Tom to make his own decision, Hal takes her with him. They head to Ferris Air where they are confronted by Mr Smith who denies being a Manhunter when challenged by Hal. Given a tip-off by a Ferris Air employee, Hal and Celia head to Alaska where they find Tom and his family, with Tom unwilling to accept the role of one of the Chosen. Mr Smith, now revealed as a Manhunter, battles Hal, planning to kill Tom but before he can deliver the final blow, he is struck by Celia who refuses to be enslaved by the Manhunters. With that distraction, Hal is able to fight back and defeat Mr Smith. With that done, Tom accepts his role and he and his family return with Hal and Celia. Obsidian receives a double shock when on a date with his girlfriend Marcie Cooper as she reveals herself not only as the new Harlequin but also a Manhunter agent trying to recruit him until he flees. Later, Dan Richards – who was both the original Manhunter as seen in SECRET ORIGINS #22 (Crossovers Week 2) and Marcie’s grandfather – has called on Molly Scott, the original Harlequin but their meeting is interrupted by Marcie’s attack. They try to escape but are driven off the road and left for dead. 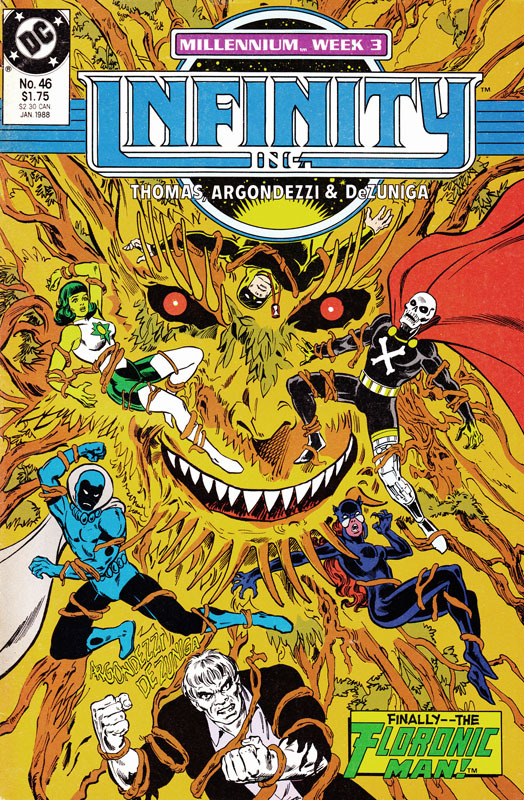 Meanwhile, Herupa and Nadia contact Infinity Inc and send them to Louisiana to find the recently escaped Floronic Man. After Obsidian tells them about Marcie, the team head to the swamp lands of Louisiana and track down the Floronic Man, only managing to subdue him when Solomon Grundy turns up. Capturing both of them, they head back to the Green Lantern Citadel.